Commissioned by the Clothworkers’ Company, Ofili has been collaborating with the internationally renowned Dovecot Tapestry Studio to see his design translated into a handwoven tapestry. The imagery reflects Ofili’s ongoing interest in classical mythology and the stories, magic, and colour of the Trinidadian landscape he inhabits. Ofili returns to the National Gallery following the exhibition Metamorphosis: Titian 2012. The tapestry goes on permanent display in the Clothworkers’ Hall following this exhibition. “Dovecot Tapestry Studio has worked with Turner Prize-winning artist Chris Ofili on a new tapestry titled The Caged Bird’s Song. 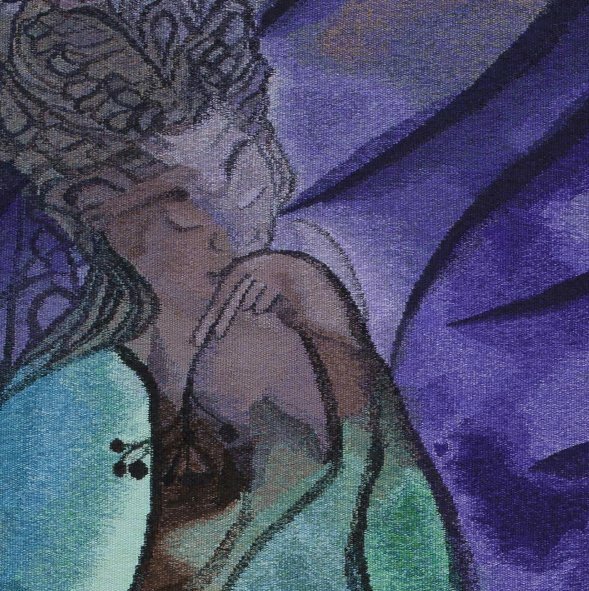 Commissioned by The Clothworkers’ Company, Ofili has been collaborating closely with the weavers since 2014 to see his design translated into a hand-woven tapestry, which took two and a half years to complete. The imagery in this new tapestry reflects Ofili’s ongoing interest in classical mythology and contemporary ‘demigods’, together with the stories, magic and colour of the Trinidadian landscape he inhabits. The tapestry is to be unveiled at The National Gallery in London, as the centrepiece to an exhibition titled Weaving Magic, from 26 April to 28 August 2017, and will be hung in its permanent home in Clothworkers’ Hall, in the heart of the City of London, following this exhibition.